The American Association of University Women (AAUW) empowers women and girls through advocacy, education, philanthropy, and research. Our nonpartisan, nonprofit organization has more than 165,000 members and donors across the United States, as well as 1,000 local branches and 700 college and university partners. Since AAUW’s founding in 1881, our members have examined and taken positions on the fundamental issues of the day – educational, social, economic, and political. Guest Speaker: Mr. McCarty, FBI Task Force Officer, will speak on the issue of human trafficking, providing an overview of the problem, what it entails, and what is being done to combat the problem. 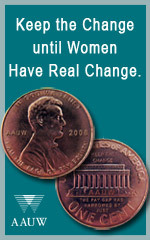 We will also provide a highlight of the public policy issues AAUW has covered in the past. Brunch menu is Quiche Lorraine, fresh fruit, sausage, pecan rolls and Danish. Please indicate if you want your quiche to be gluten free. Dessert is a Pecan Ice Cream Ball. Early reservation cost is $ 21.00 per person if received by May 6. On time reservation is $25. Registration deadline is Tuesday, May 13. We welcome all and we want you to be able to come so if you need a ride, please contact Cathy Huff at 260-403-7074 so she can arrange car pool services. Early Bird reservation is $21 per person if received by Monday, May 6. On-time reservation is $25 per person if received by Monday, May 13. Your reservation and check must be received no later than Monday, May 13, 2019.